Before you vote in the upcoming election, find out where the candidates stand on the issues most affecting your business by reviewing the REALTOR® Voting Guide. REALTORS® are the professional trade organization for real estate in King County and Washington State. 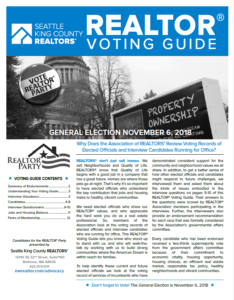 To assist King County real estate licensees in making the most informed voting decisions the Association publishes the REALTOR® Voting Guide. The 2018 General Election Guide will be released later this year. REALTORS® don’t just sell homes. We sell Neighborhoods and Quality of Life. That’s why it’s so important to have elected officials who understand the key contribution that jobs and housing make to healthy, vibrant communities. We need elected officials who share our REALTOR® values, and who appreciate the hard work you do as a real estate professional. So, members of the Association look at the voting records of elected officials. And it’s why your REALTOR® colleagues interview candidates who are running for office. This REALTOR® Voter Guide lets you know who stood up to stand with us, and who will walk-the-talk by working with us to build strong communities where the American Dream is within reach for families. Seattle King County REALTORS® are committed to increasing member and public awareness of, and involvement in, governmental and legal issues affecting real estate in our region.